Ross Kemp, owner of the independent diagnostic specialist Scantec Automotive, reports on a recent case that proves why independents can compete with, and even surpass, main dealers when it comes to diagnostics. Issue: Cooling fan running constantly at high speed for approximately 30 mins after engine shut down. We commonly get asked if we are able to assist in diagnosing a particular fault, with the follow up comment being: ‘if not, we will take it to the dealer’. This response from some customers quite frankly makes my blood boil, as clearly there is still this massive misconception that if all else fails, the franchised dealers will somehow come to the rescue like knights in shining armour, as after all, they are the brand specialists. 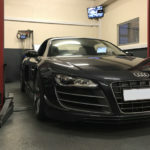 I would like to share with you a recent troubled vehicle that visited our diagnostic workshop having already visited the dealer, and try to show why this misconception is so truly outdated and how a good invested independent workshop can, in most cases, offer a much better value for money option, particularly when it comes to diagnostics. 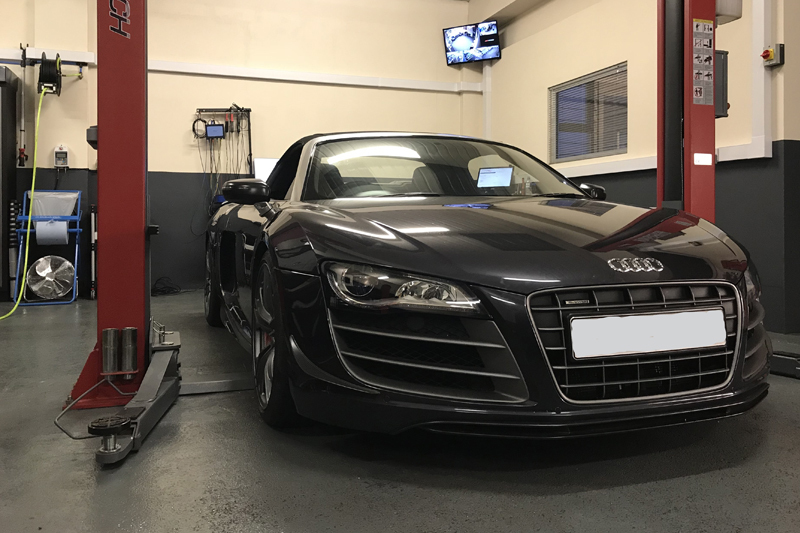 The vehicle in question was a 2012 Audi R8 GT Spyder that was presented to us with the customer complaining that the cooling fan would run constantly at high speed for approximately 30 mins after engine shut down. This vehicle had spent over eight hours at the franchised dealer for this exact same fault and it was eventually brought to us after the dealer requested more diagnostic time. Now, this vehicle runs two identical cooling fans at the front. Initial inspection confirmed that the off-side fan did, as reported, run at full speed from initial ignition on and would continue to run for approximately 30 minutes following ignition shut down. We also knew that a new engine coolant temperature sensor had been fitted and cooling fans had been swapped from left to right. Initial global fault code analysis confirmed one stored fault in engine control: ‘001153 Coolant Fan Control Circuit 2 – Electrical Malfunction’. However, this fault cleared down and did not return. A quick check of the wiring diagrams confirmed that the fans have an internal driver circuit (so the ans are wired with main power and ground for carrying fan load), a smaller power supply for the fans’ internal control module and an engine control module duty signal for command of fan operation and speed control. ECU is commanding fan operation due to a perceived threat (coolant temp too high, air-con pressure/temp issues or even intake air temp initially sprung to mind here). However, I found this scenario unlikely, as why would it choose to run one fan at 100% and the other not at all? Engine control module is requesting this fan to run due to an internal ECU issue. Cooling fan has internal issues causing fan to run without request. Wiring fault between ECU and fan. Live data monitoring confirmed all four air, aircon and engine temperature readings were stable and plausible, ruling out option 1 straight away. As all three other possible options are command related, we initially scope tested the control circuit power supply while also monitoring fan command – which in this case is a variable negative switched duty signal. Initially, all looked to be in order. We had a duty signal and stable power supply at the fan connector plug, suggesting no wiring issues, so why was the fan running? 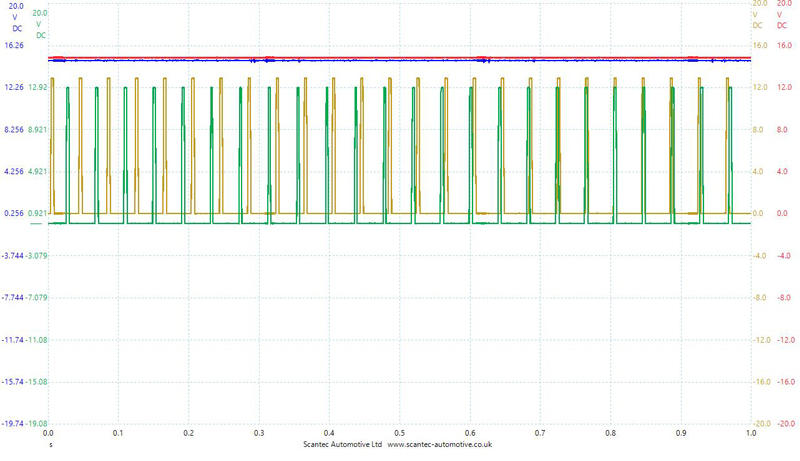 It was only when we disconnected the fan plug and retested this ECU command circuit that we noticed that the duty signal we were actually seeing was in fact coming from the fan itself and we had a flat line coming from the ECU – was this correct? We suspected not, as with most duty circuits a signal would always normally be present even if the request was in effect 0%. Luckily, as this vehicle has two identical fans we were able to very quickly confirm by disconnecting the nearside fan that a duty signal was present from ECU even with fan disconnected. So we then knew that the missing command signal from the ECU was causing the cooling fan to run in emergency mode, and just to prove this categorically before we delved deeper, we ran a quick jump lead from the N/S fan’s control signal to the offending O/S fan – proving that the fan no longer ran in emergency mode and could be activated via control module activations throughout its full speed range. So back to the ECU and/or wiring. 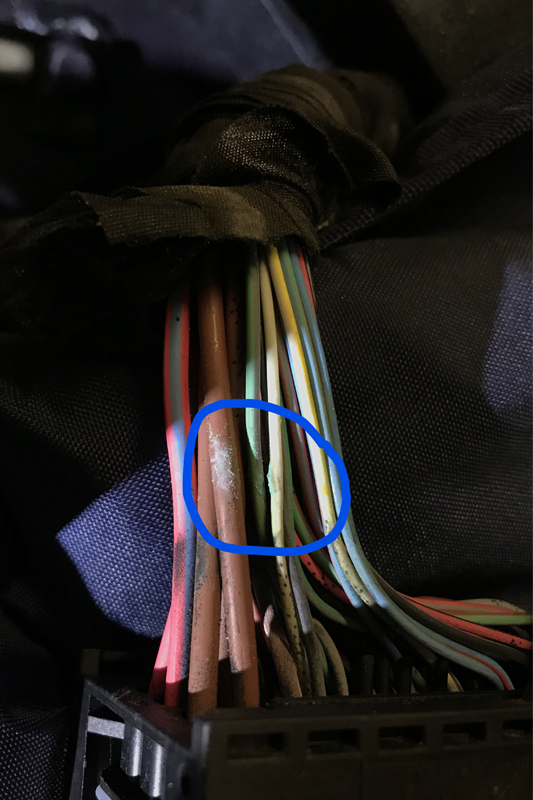 After removing the devil’s security bolts from the relevant engine control module (V10 Engine runs two ECUs – one for each bank) we were just about to gain access to the relevant multiplug that carries the Fan two command signal, when we noticed a little of our favourite colour… green. As can be seen below, it was instantly obvious to us that we had some wiring corrosion on the Fan two command wire. Carrying out a wiring repair quickly established that fan two was no longer running in default emergency mode and both fans could be correctly actuated throughout their full speed range. The normal idle fan duty command was rechecked at both fan units on completion, as shown below. Now, although I have tried to detail the initial diagnostic approach, thought process and test plan for the purposes of this article, in reality the physical testing up until confirming ECU and/or wiring issues was approximately 1.5 hours’ diagnostic time. The extra time to gain access to the ECU, removal of the devil’s ECU security shielding and repairing the wiring was repair labour and not diagnostic labour. Having given this quite some thought, I fail each and every time trying to compile an eight-hour test plan, let alone one that does not yield results. Yet, apparently, the franchised dealers are seen to be the specialists. Don’t get me wrong, I am not dealer bashing – in fact I know of many very capable technicians across the UK that have worked or do work in dealerships. The problem as I see it is twofold. On one hand, the manufacturers seem to be adopting a test plan culture over and above a training one. This allows them to streamline the diagnostic process, enabling uniformity with regards to diagnostic approach and testing, allowing them to employ technicians that can simply follow instructions. This in my opinion stifles any individual’s ability to think outside of the test plan. When you also consider the other driving factors of sales targets and staff bonus schemes, the environment for diagnostics is now seriously limited, which is of benefit to independents.